It’s been said that the eyes are a window to the soul. Your face is also a window—by looking closely at your facial features, you can read details of your own health. Sometimes looking into the mirror may show something surprising, even unsettling. But how can you know whether a facial change is cause for concern or something harmless? This article is designed to cover some of the many health symptoms that can show up on your face. You will learn about moles, facial paralysis, and bloodshot eyes. You will discover what it means when new hair sprouts where it hadn’t been before, and also when familiar hair falls out. So read on to find out what your face may be saying about your health. If you’ve discovered that your eyes and skin have taken on a yellow hue, it could be a dangerous sign. Jaundice in babies who are less than 38 weeks old is typically harmless and quite common. But when it appears in adults, you will want the advice of a doctor. 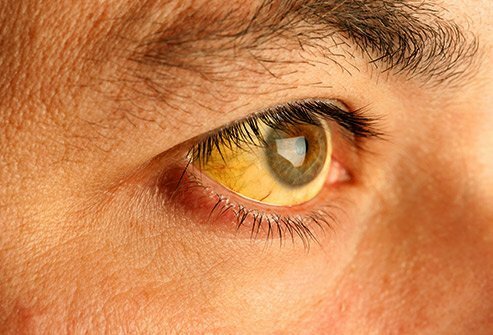 Jaundice can indicate a viral infection like mononucleosis or hepatitis. If the infection is short-term, it is usually accompanied by other signs like fever, chills, and other flu-like symptoms. Jaundice can also signal problems with your pancreas, gallbladder, or liver. These include gallstones and pancreatitis. It may also be a sign of alcohol abuse. Because so many problems can cause your skin and eyes to yellow, you will need the careful examination of a doctor to get the root of the problem. Borders: Are the edges jagged or do they seem to “bleed” into the surrounding skin? Are the edges notched or scalloped? Color: Does the mole have a variety of colors, rather than just one? Cancers can present as various colors, including tan, brown, black, white, red, or even blue. 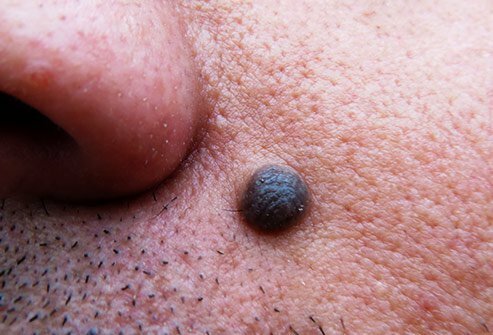 Benign moles are usually a single shade. Diameter: Is the diameter of the mole bigger than the tip of a pencil eraser? Larger moles may indicate cancer. Evolving: Does the spot evolve or change over time? Changes may include color, shape, size, or when a bump begins to crust, itch, or bleed. These all may indicate cancer. If the spot on your face causes concern, show it to a doctor. Sometimes a sore is just a sore. 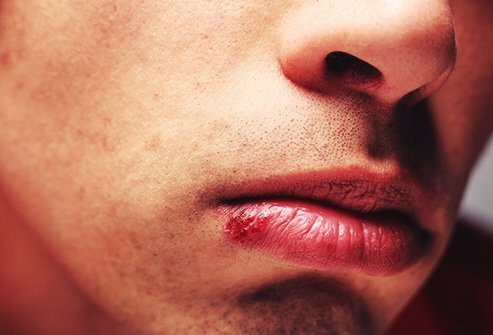 But if it appears around the lips and mouth it could be a cold sore, which is caused by the herpes type 1 virus. Cold sores are very common. Worldwide, two out of every three adults under age 50 is believed to have them. And once they’re there, they will appear from time to time throughout life. The symptoms of oral herpes are usually mild. However for anyone whose immune system is weak, the symptoms can be more severe and can come on more frequently. There is currently no cure for cold sores. Cracked and chapped lips are common under certain conditions. A cold winter can bring them on, as can a dry environment like a desert. It can also be a sign of something more serious, though. Sometimes cracked lips indicate dehydration, which can cause dizziness, fatigue, and in extreme cases unconsciousness and even death. Cracked lips can also indicate an allergic reaction to medication. 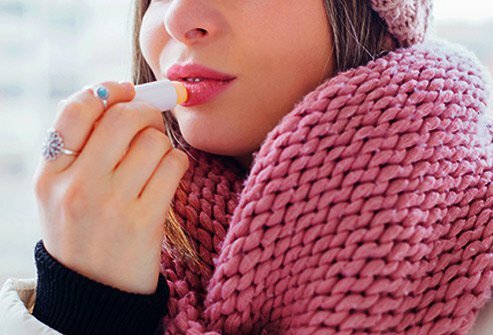 If you also have red, inflamed sores in the corners of your mouth as well, your chapped lips could be telling you that you have a condition called angular cheilitis, which can be caused by an infection. At other times it may be a sign of eczema, particularly for those who wear dentures. Most rashes come and go, and are typically not very serious. However a butterfly rash is something different. Butterfly rashes cover both cheeks, forming the shape of a butterfly. 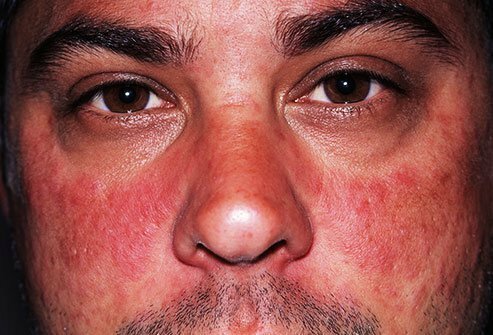 If you spot a rash like this in the mirror, you may have lupus. Lupus is an autoimmune disease. It causes the immune system to attack healthy body tissue. People with lupus often experience stiff and achy joints, fever, and fingers that turn blue when it’s cold. If you have a butterfly rash you will want a doctor’s examination. It’s not unusual to find hair in strange places as we get older. Older men tend to find new hair growing in and around their ears, nose, and eyebrows. Aging women may find their facial hair growing coarser, particularly around the lips and on the chin. Although it may be disquieting, this hair growth is considered normal. However when a young woman begins to develop facial hair, it can sometimes be a sign of a larger problem. Sometimes new facial hair growth is a sign of polycystic ovaries, a common condition that affects about 20% of women. It makes pregnancy more difficult and has been linked with a higher risk for high cholesterol and type 2 diabetes. That’s why young women who notice new hair growth should visit a doctor. With treatment, most women with polycystic ovary syndrome can get pregnant. When you look in the mirror, have you noticed your eyelids droop over your eyes a bit? Sometimes this happens to only one eye, and sometimes it is more than a bit—it can even cover the pupil, causing vision problems. Doctors call the condition ptosis. Some people are born with it. For others, it may be caused by an injury, or as a normal effect of aging. 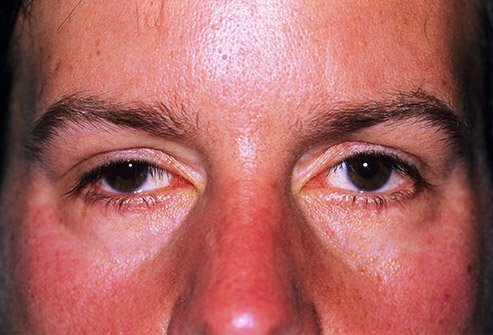 In rare cases, droopy eyelids can indicate a disease or tumor is impacting the muscle that lifts your eyelids. Ptosis can be treated with surgery as an outpatient procedure. As with any surgery, there are risks and complications that can arise, so be sure to discuss these in detail with your doctor first. You probably don’t need a mirror to notice this one. Anytime you can’t move some part of your body, you should seek medical care immediately. That said, if you have no other symptoms, a motionless half-face is most likely Bell’s palsy. The good news is that this condition is temporary. Mild cases can last for as little as two weeks. Complete recovery is typical after three to six months. Bell’s palsy occurs when the nerves that travel through the skull, behind the ear, and to the face become inflamed, compressed, or swollen. This condition can be mild, causing minor weakness, or severe, causing full paralysis. There’s one nerve for each side of the face, which explains why only one side is affected. The condition is thought to be caused by a viral infection. People with diabetes or upper respiratory infections (think colds and flus) are more likely to get Bell’s palsy. 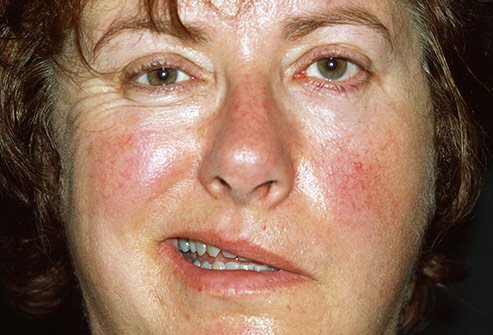 Without other symptoms, having half your face paralyzed usually means Bell’s palsy. But if you also notice weakness and numbness in your arms and legs, dizziness, double vision, slurred speech, or difficulty swallowing, you may have had a stroke. A stroke results when the blood that flows to your brain is disrupted by either a blocked or burst blood vessel. A stroke is a serious medical emergency. The sooner you can get help and an accurate diagnosis, the better. 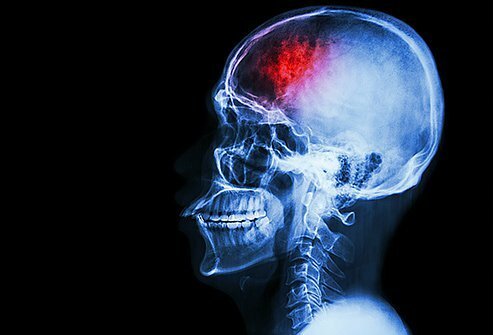 If a stroke caused by a blood clot is treated within the first three hours, emergency workers can administer a shot called tPA (also known as Alteplase) that can save your life and reduce your chances of problems over the long haul. For this reason, time is of the essence—lost time can lead to permanent brain damage. Yellow Bumps Under Your Eyelids? Look closely at your eyelids, and you may discover small, raised, yellow bumps on or near them. If you notice these bumps, you’ve found lumps of cholesterol deposits known as xanthelasmata (also xanthoma). Those most likely to acquire these small lumps are women in their 30s and 40s. These yellow bumps are harmless, though they may be unsightly. They can be removed, but surgery can leave scarring, and they often reoccur. Because this is a cosmetic surgery, it may not be covered by your insurance. About half the time, xanthomas indicate high cholesterol. 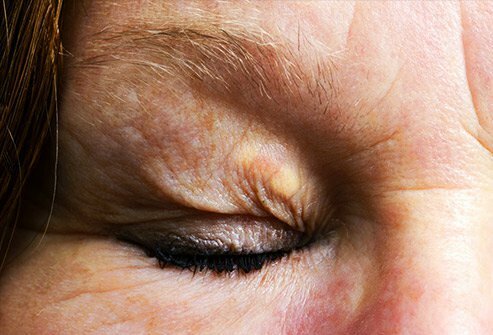 Even if your cholesterol levels are within normal range, these eyelid lumps may indicate a higher than normal risk for atherosclerosis—the hardening of the arteries that contribute to heart attacks, strokes, and other cardiovascular problems. Puffy eyes can make you look tired. That actually makes sense, because one of the causes of bags under your eyes is exhaustion. But there are other causes for puffy eyes as well, including a diet high in sodium, not getting enough water, and hormonal changes. Chronic allergies can cause this problem too, and should especially be suspected if your eyes are red and watery. Baggy eyes can often be improved by correcting these problems. If addressing these causes doesn’t help, there are several home remedies available for bags under your eyes. One standby is to soak tea bags in hot water for about three minutes, then leave them for a few minutes to cool before placing them over your closed eyes while lying down. You can also put the bags in the fridge after they soak if you prefer a cool treatment. Cucumber slices work too. Both black tea and cucumbers are astringent, meaning they constrict blood vessels, so letting them rest on your eyelids for about five or ten minutes can help reduce eye puffiness. When you look into the mirror, do you see brown or brownish-gray patches on your cheeks, nose, or forehead? 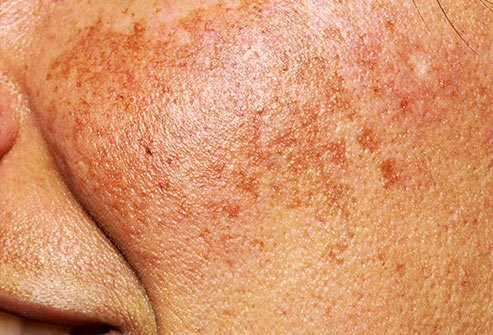 This could be melasma, also called chloasma, a common skin condition that is far more common in women than in men. In fact, about 90% of people with this condition are women. People with darker skin and those who live in sunny environments are also more likely to have melasma. Although you may not like the way it looks, melasma is harmless. It’s non-cancerous and won’t develop into skin cancer. The patches usually go away on their own after pregnancy or after ending birth control, but not always. Sunscreen helps. Treatments are available, including a medicine called hydroquinone, which lightens the skin. Other medicines may be used at the recommendation of a dermatologist, as well as other procedures, including chemical peels and microdermabrasion. 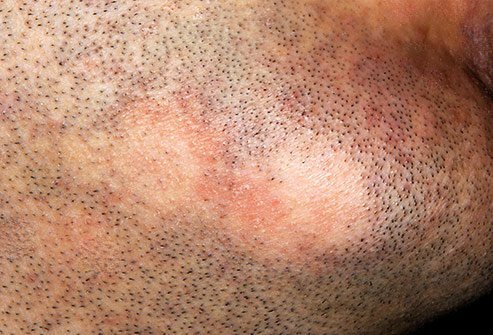 Patches of lost facial hair come from alopecia areata, a common autoimmune condition. An estimated 6.8 million Americans experience this skin condition, which leads to total scalp hair loss or hair loss all over the body about 5% of the time. Alopecia areata is not contagious. It is caused by your body’s immune system attacking hair follicles. It often starts in childhood but can occur at any age, and both men and women are vulnerable. The good news is that the hair often grows back. The bad news is that the hair loss may come back as well. Dermatologists can help with a variety of treatments, so if you are bothered by alopecia areata there may be methods available that can help you. 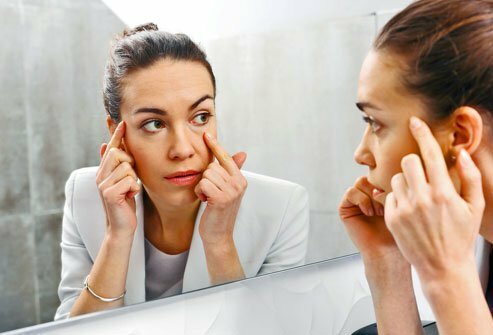 Dark circles beneath your eyes can make you look sad, tired, or even hungover—but they’re nothing to worry about from a medical standpoint. They can affect any face, any gender, any age. And their causes are many. Sometimes it’s allergies. Sometimes it’s your skin thinning. Sometimes it’s stress. Sometimes the dark circles are simply your natural pigmentation, while in some cases the dark areas are a trick of the light caused by the shape of your lower eyelid. Just as dark circles have many different causes, there are also many different treatments. Dermatologists can employ skin-lightening medications, and there are cosmetic procedures available like soft tissue fillers, laser resurfacing, and surgery. Choosing the right treatment comes down to the contours of your face. Whether the dark circles result from aging, facial fat, or pigment all make a difference in choosing the right option, so consulting with a quality dermatologist is key. Are you noticing deep, red veins in the whites of your eyes? 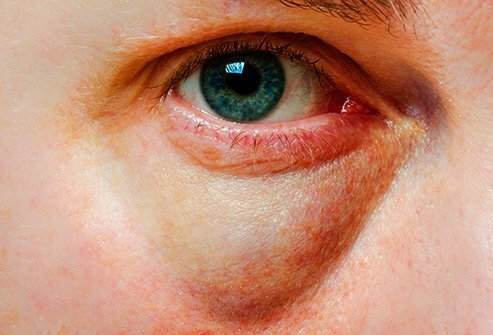 Bloodshot eyes can be anything from a minor burst blood vessel to something serious like acute glaucoma. If your eyes are painless, bloodshot eyes are usually one of two things. It could be a burst blood vessel, which can be caused by something as insignificant as coughing. This will look especially nasty if you’re taking aspirin, which reduces your blood-clotting ability and will emphasize the redness. It could also be conjunctivitis, which is an inflammation of the thin tissue layer that surrounds your eyeball. 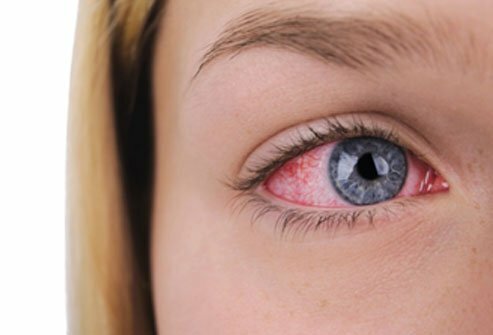 Both of these conditions could get better on their own, though conjunctivitis may require antibiotics or other treatments. If your eye is in pain and you see red, though, you could be facing a more serious condition. Iritis occurs when the iris (the colorful area around your pupil) becomes inflamed. This tends to respond well to steroid treatments. Sometimes an infection will cause a corneal ulcer, which can also make your eyes sensitive to light. This condition is more common in people who wear contact lenses or who often get cold sores. A scratched eye can cause pain, too. Perhaps the most serious condition is acute glaucoma, which can also make your vision blurry or cloudy and may make you feel sick as well. Acute glaucoma can blind you, so this condition needs to be medically treated right away. NHS UK: “Red eye," "Sore or Dry Lips." NIH: “Bell’s Palsy Fact Sheet," “Dehydration,” "What Is Lupus?"